Ackpf! A public Internet connection? Many readers of this post are likely, and rightly, shocked by the notional connections of the VAPN system to the Internet. After all, our crowing up to this point has preached the mighty gospel of security assuredness wherein the best and safest course of action to prevent break-ins is simply to never connect the gear to the Internet. 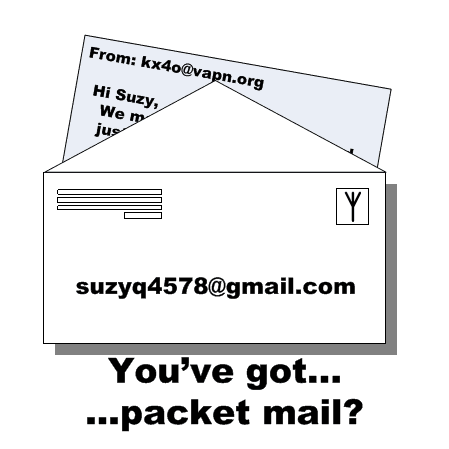 Unfortunately the #1 most requested feature from potential VAPN patrons is some form of connectivity to the public email system. Winlink is often the other word in their feature request. With this hair raising request in our minds, we set about researching just what it takes to accomplish the goal. A way for the BPQ mail system to cache Winlink messages on behalf of a BPQ user. The first “pipes” Winlink service to the VAPN service area. The second stores messages on VAPN equipment for later retrieval by a VAPN patron. The F.C.C. says it is merely enforcing the law. It issued fines and warnings to amateur radio operators last month after they relayed, some unwittingly, an antiwar solicitation that officials said violated rules against commercial messages on amateur radio waves. Much has been said since the 1991 New York Times article. Hope comes from rule 97.219(c),.. Emphasis added. All that said, the 1991 actual FCC action is the most recent I have found yet concerning packet radio – Actual case action trumps rules until the new rule is actually tested. It’s reasonable to take the threat seriously. Banning all email connectivity entirely is the obvious safe play, but we are nonetheless exploring options to see what might be viable. A very good question concerns a message from an outside email to someone on packet. Is the intermediate gateway the person placing the message into the ham system once it transmits the message to the packet user? Or is the email sender considered the originator? Questions like these definitely make mere technical hurdles seem simple by comparison. It is important to understand the FCC’s jurisdiction is finite. Don’t expect part 97.anything to help you if you pass a defaming message or a zero-day virus/link through your system. One fallout from our research was the pleasant find of a POP and SMTP capability directly within BPQ32 BBS application. “Whoa what’s this?” was our immediate reaction. We’ve tested this capability on our operating prototype system and it works. As part of our test, we bootstrapped a fresh MX machine on the Internet just for this purpose and the results are quite positive. There is no “pipeline only” operation in this scheme as messages to and from Internet email addresses are stored like any other message in the BBS system. Hence, VAPN still runs the risk of transmitting inappropriate content on the ham bands when the VAPN user retrieves messages over the air. As the colors in the above figure attest, we have no control over anything Winlink does with their system concerning security and message vetting. We do, however, have full control over our mail exchange machine we maintain strictly for VAPN email purposes. With such control, we can rule over the email gateway with strong authoritarianism to better manage and perhaps reduce the risk of rule violation. Yeah I’m sure the Winlink folks are working hard on some or most of these issues, but until some sort of collective acceptance of their ways settles in, we are likely better off “rolling our own” mail for now. Thankfully, the BPQ32 software’s email gateway feature provides the perfect opportunity to bootstrap an email solution. Another aspect to keep in mind of the two approaches is this… One approach uses legendary server-grade, mail-exchanger software running on an up to date, well secured, Linux system managed by paranoid, security conscious, server admins in a data center environment. The other approach is Winlink. Think the two are the same? Maybe they are, but we don’t know how to tell. One of the notes in the Winlink FAQ suggests as of 2007 the WL2K software has about 20 man-years of development effort. This is a serious effort no doubt, but one has to wonder how well that competes with traditional email server software with development efforts measured in man-decades. Strip attachments (BPQ apparently supports attachments in some form, but VAPN will likely quash them). The kids and I made it to Big Meadow campground fine. Thanks for letting me know – I “really” appreciate it. Don’t forget the anti-histamine meds in the top pocket of the knapsack. Jack picks up the message from Jill a few minutes later and all is well. No 10k messages needed here. Health and welfare in its purest form. Amateur radio making a difficult communication possible. Messages much larger than the above suggest the purchase of a satellite phone/modem to solve your digi-commo problem. Note: Winlink FAQ Question #170 says “120,000 bytes is the largest ‘compressed’ message size that will be accepted for Winlink,” but advocates using much smaller sizes as a practical matter. Despite this rock solid advice, the mere capability of a message this large is way too generous for serious use on pragmatic amateur radio digital modes. On the other hand Winlink has a loftier, more Emcomm oriented, goal than VAPN. In a perfect world, our significant others would be hams as well so both would use amateur radio to communicate the above Jack and Jill example. The real world is the real world so it’s no surprise the feature requests we receive concern contacting loved ones via an email gateway. Add the fact our gracious hosts providing VAPN with some hilltop rack space are making these requests. We have to listen and see if there is a fit. If we do support the email gateway feature, keep in mind if we ever feel our amateur licenses are threatened by operating the VAPN, it will be promptly brought down for good – life’s too short.